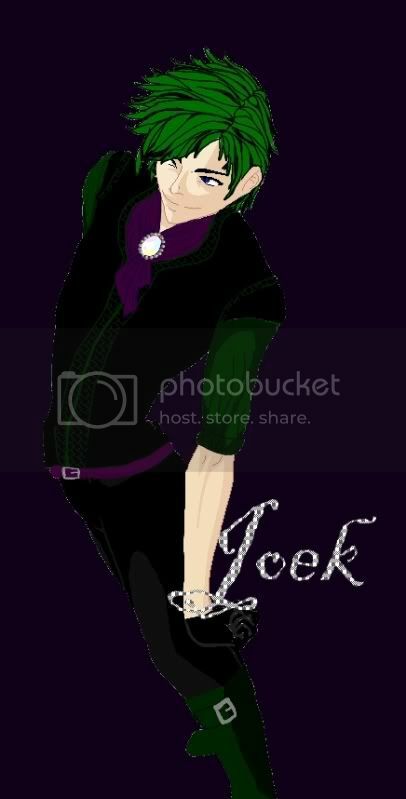 Joek is a lean well dressed man with stark green hair and deep blue eyes. He has incredibly pale skin, and a thin face and surprisingly large mouth. He is never without his black gloves, and keeps his clothes in pristine shape despite how dirty his line of work is. Personality `` Joek is a manic depressive sort with a form of bipolarism that exhudes itself in wild mood swings. He is quick to anger, and fast to excite. He has a love for brain teasers and has a devout case of sociopathy. Some think he has multiple personality disorder as well, but no one can prove it. History;; `` Joek was born and raised in Shayzrenth's underground. He quickly rose through the ranks of the streets using a tight knit group that are no longer with us. The true history of Joek is a mystery, but details arise in almost every day life. The recent history is all you can really have. Joek runs the Troupe. A gang of misfits and murderers that Joek has personally helped from the authorities that feel they owe him big. That and if you disrespect Joek, you don't live long. Many among his Troupe are fanatic for him, thinking him some sort of divine person from underground. He has claws in just about every politician, every trader, and every family that has ever caught his fancy. If you need something, Joek can get it. But will absolutely cost you more than you expect to pay.